Ric Birch was contacted by Shanghai Expo organisers in October 2009, only six months before the opening day, to devise and create an impressive outdoor event to launch the latest and greatest World Expo in history. 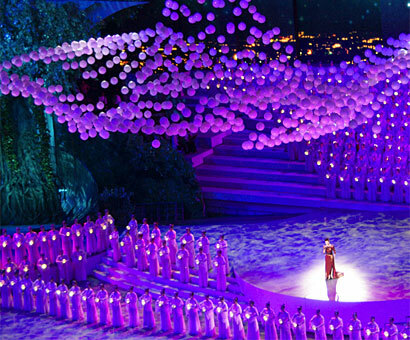 He was able to put together a production plan for fireworks, fountains, bridges and buildings that formed the basis for the show that was launched on 30 April 2010 by five different production companies - DAE from Australia, ECA2 from France, and SMG, Shanghai Song & Dance Company and Beijing Haosi, all from China. Their joint efforts lit up the sky over Shanghai from the Lupu Bringe to the Wangpu Bridge - a distance of three kilometers along the riverfront where 250,000 invited guests joined the Chinese President and the Expo dignitaries to celebrate the opening of the Expo which has more than 250 corporate and national exhibitors and is expected to attract 90 million visitors before the closing ceremony on 31 May 2010.